I admit that I'm a bit stressed recently. The assignment and situation really make me can't breath sometime. Hope there is any hands that can pull or hold me. Big hand, small hand, long hand, short hand, thin hand, fat hand....I don't care what hand. Not far from now, I will accepting something really new for me, something that make me have the interest and intend to know more of it. That is really a totally new and strange for me. Hope it is still not too late. Here are some randomness of mine for readers who reading my blog. Will you able to interpret a situation with only a few hints? You may found a emergency door to exit from stress if you are lucky enough. It may takes time, need of opportunity and chance. The amount of my workload is just like the numbers of plates. Will you break the rules and take the risk when you feel you need to? Choose to smile when facing the worst things or become 'ki siao' ? Listening the "Secret Garden The Deluxe Version" I get yesterday (Wao, this album worth RM81 after discounted in Popular bookstore). Just finished my homework and take some time to update my blog. By the way, I already read though the marketing notes and I think I able to catch up the lesson on next Tuesday. Accounting and BFF still in the process, I think I manage to finish it on time also. My japanese notes still resting in my bag, leaving untouch. Oh no... Sensei had asked us to read Chapter 4, I hope I manage to finish it too. Quite worried for it. どのよう??? Well, this holiday can be the holiday I eat less TI food. Thanks to afternoon nap and late morning wake. Aiks, just found out I didn't bring back my bluetooth adapter and card reader. Not able to upload the photos I snap using my phone. As usual, I will need to pass through KL to changing the bus when going back to Teluk Intan. Went to Petailing Street to have some snack and drinks before going to watch movie at Times Square. The sky was cloudy that time. The LRT and Monorail not so crowded that day because it was weekdays. It was 12.30 when I reach Times Square, can't redeem the reserved ticket as I didn't turn up 45minutes before the movie. Nevermind, since I manage to reach cinema 15minutes before the movie start, I just buy ticket directly. Just like what I thought, that cinema have only a few people that day. The revenge is coming. 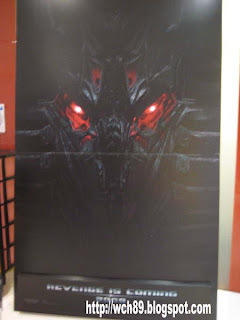 Transformers 2. After finish watching, think to have my lunch at Times Square. Walked around, search the place, at last I still give up eating in Times Square, because I think to have the Wan Tan Mee I have neglected long time. Hehe. Before going to lunch, I went to Low Yat Plaza to get price list from computer shops, mark the price and things I want to buy. It was already 4.00p.m when I came out. Better walk faster to eat as my stomach is 'concert-ing' and I need to get on to bus at 6.00pm. The Japanese restaurant I passed many times. 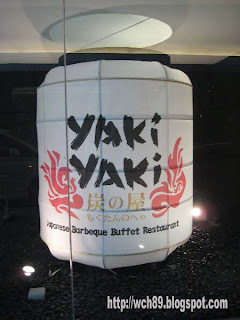 I saw a new opened Japanese restaurant too. It attracted me! Why? Because the customer will have 50% discount on the bills for dining there. Haiz. 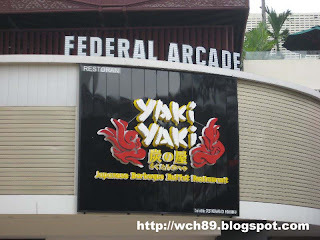 If I come out earlier from Low Yat Plaza, I will have enough time to enjoy the buffet. Maybe this coming Sunday I will come again if I have enough time. "Hungry hungry hungry". Thats my mind keep telling me. 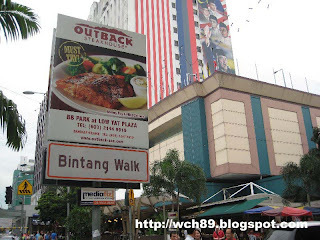 Walk faster and I reach Bintang Walk. Turn left to my destination. 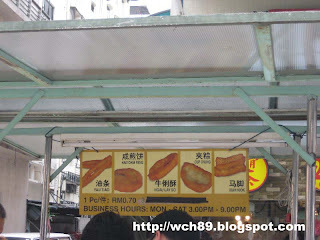 Rm0.70 for one piece of douge. Many people in this stall. Here I reach. 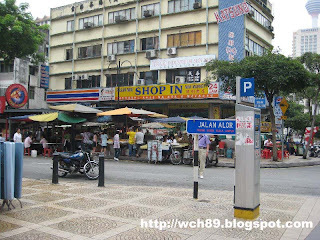 Jalan Alor. Walk into the restaurant and sit down. Without reading the menu, I ordered the food I want to eat. 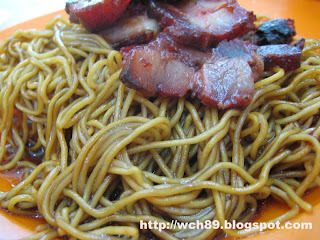 Wan Tan Mee and ice Crysanthemum tea. Yea, finally can eat lo. The set I always order from this shop. Wake up at 4.30a.m in the morning, received an SMS the depart time delayed to 6.00 a.m because of the heavy rain. Can sleep one more hour only? Better don't, I worried I will not able to wake up on time again. Our early morning Dim Sum breakfast. My 'Lo-mai gai'(glutinous chicken rice). It was almost 12 something when we reached Mersing. Due to the unclean seaside (I got snap photo of it, but I not gonna post here), we changed our plan and move to Air Papan, which is 15km away from the town of Mersing. If not, we will have to drive to BBQ at night. Lol. Drive to BBQ? Weird right? We had our lunch before we depart again. My lunch, Bak Kut Teh in Mersing. (Awww, I love bak kut teh). Taste so so, at least better than Malacca's. Only me ordered bak kut teh since it is my favourite. While all of them ordered rice. I feel lucky because I got the really bad comment from them who ate the chicken rice, duck rice, char siew rice (ai ya, don't care what rice already la). Some of them even said it is hard to swallow the rice. How horrow is that! Lucky me! Hmm. Finally we reach the sea we desire, Air Papan. The landscape is far more nicer than the previous one. Innocent kids playing at the seaside. Of course, I wrote my name on the sand. We start training at the afternoon at 3 o'clock something. Of course, we play in the sea after the training. It is our free time before dinner. Of course I will go out and snap photos. Quack quack quack, we are walking back. 1,2,3. Lap lap, lap by lap. Tayar tayar~ Whose stomach want to grow tayar? See the flags. Nevermind, still have few months for National Day. Shark's mouth. 5 layers of teeth and still sharp when I touch them. Goat also eat Gardenia bread? It is dinner time. We hava chicken and cencaru for BBQ. Where is the girls while the guys preparing the food? Sleep very early (9 o clock something) after the dinner. The next day, some of us wake up at 6.00 a.m. to see the sunrise. Some of them not manage to wake up. Patterns made by artistic little crabs. Little crab is digging a hole. This is the 'dai-ko' among the little crabs. Feel very pain pinched by it. In the afternoon, we went Kluang for lunch. Half-bridge. How can people cross the road? Unique design of the building. Ahhh! My camera's battery ran out when lunch. Have to use my phone to snap. Siew pao. It is good in looks, crispy when bite. Very nice! Egg tart. It is too small until I need to move my phone nearer to snap it. We straight away go to have our afternoon tea right after the lunch. Kopi-kao. Kao, which mean thick. But I don't feel the coffee is thick also. They are so full to order anything. Since I wanna try the bread here, ordered one bun. We went to Muar to have our dinner before back to Malacca. Nothing special here included the Otak-otak. Not so good, I believe we found the wrong place. It is hard to believe this happened. Somemore happened in MMU. Somemore during exam time. The candidates have no seats and exam paper for mid-term test. Can you believe it? I have to, because I experience it. Stood for 10 minutes plus waited for 25 minutes. We had wasted at least 35minutes for the mid term test. Hope those who going back right after exam won't miss the bus. Aiyoyo. See this 2 girls, no seat, no exam paper still so happy. Involved many student because of the inXXXXX of management. Being settled in a hot and small place. Well, things doesn't stop here. Most of us got photostat exam paper instead of normal exam paper. The marks given makes my mind almost blank. Went to IBM Plaza located at Bandar Utama this morning. Thanks lecturer for the morning call, if not I guess I really will miss it. In this trip, I gained many knowledge about IT and IBM. Their working environment, their culture, the software they are using. We been brief (or can say lecture, the environment in the room make people feel sleepy easily) about IBM. The drinks making machine. I wish to have one in my house. 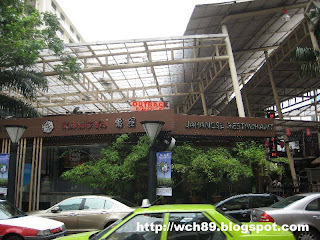 In the afternoon, we went to 1Utama for lunch. At the end of the briefing, we have a tour in IBM. Went their work place and server place. Every IBMer (people who working in IBM, they called that themselves) is carrying a IBM laptop on their hand. The first time I saw mainframe. Didn't forget to take photo. Group photo. Can you locate me? With IBM-er. They are 厉害的人. Reach MMU at 8 something and studied marketing in library right after getting down from bus. Besides burger, I can't think of any other thing to eat for dinner after 10 o clock.